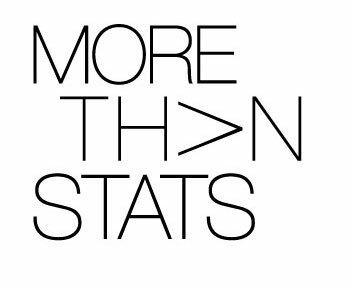 Its game day yall!! 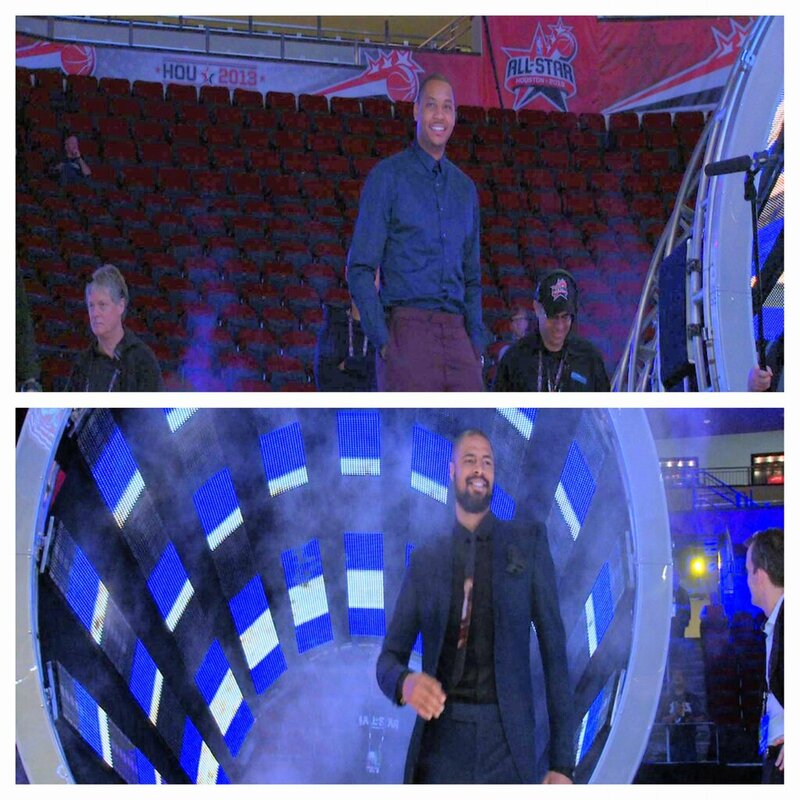 NBA All Stars made sure to pull out their best ensembles as they arrived to Houston’s Toyota Center for the 2013 All Star Game. As an NBA All Star, you have to make sure to end the weekend off right , lets take a look at some of the swagger from the evening , whose look caught your eye ? Dwyane Wade(Miami Heat) always finds a way to stand out from his peers, D-wade took it up a level for the all star game, as he goes with a sleek black A.Sauvage suit, he adds flair to with a crafty $206 bow-tie by Cor Sine Labe Doli and lustrous pair of gold Del Toro wingtips. Gold all in my shoes! that sounds wack let me stop. 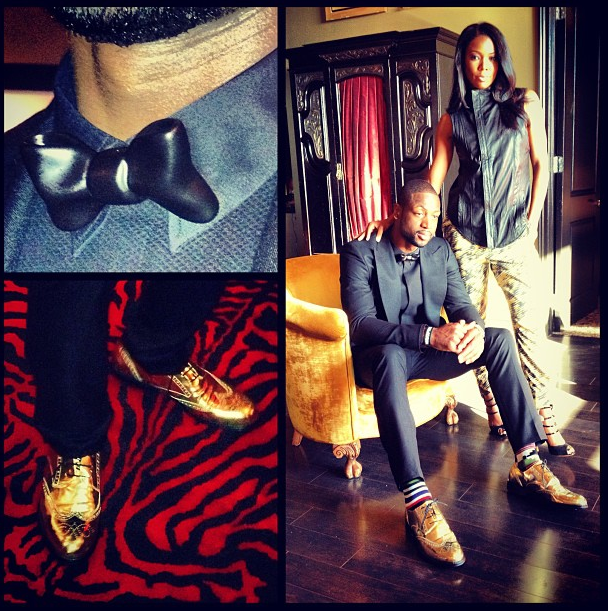 Your boy D wade sets trends though, never seen a bow-tie like this one. 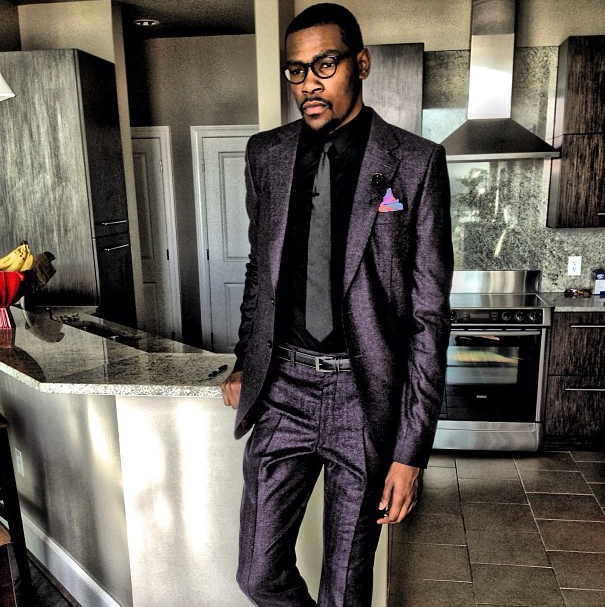 Kevin Durant(OKC Thunder) cleaned up nice in “All black everything” attire, love the touch of color with the pocket square. 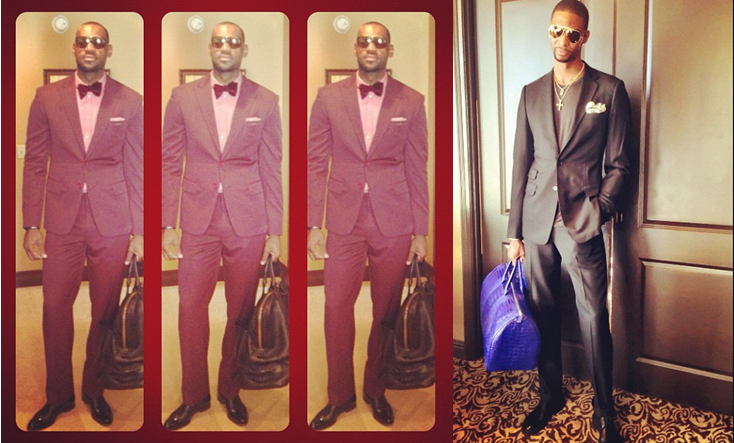 Miami Heat Lebron James and Chris Bosh decided to accessorize with duffle bags for the evening. Lebron enrobed in a solid Waraire Boswell two-button suit he spruced up with bow-tie and sunglasses. Chris bosh also opted for a two-button suit, dressing his down a bit with a crew neck shirt, Bosh bag had to grab all the attention from his attire. 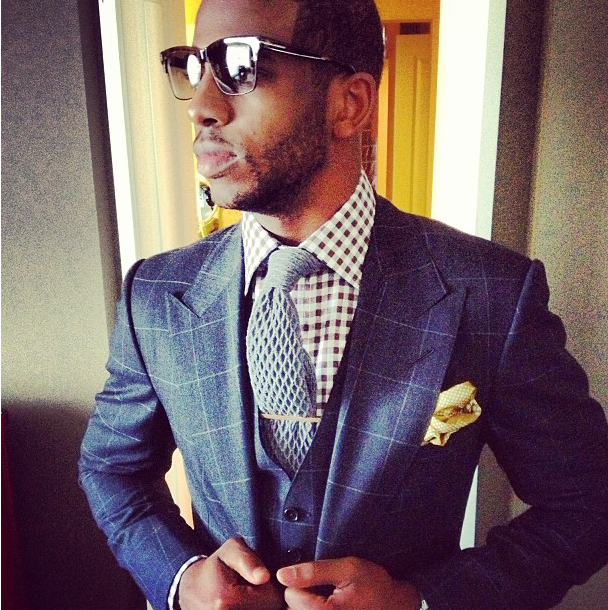 Gentlemen two-button suits is the way to go, there much cleaner and youthful in my opinion. 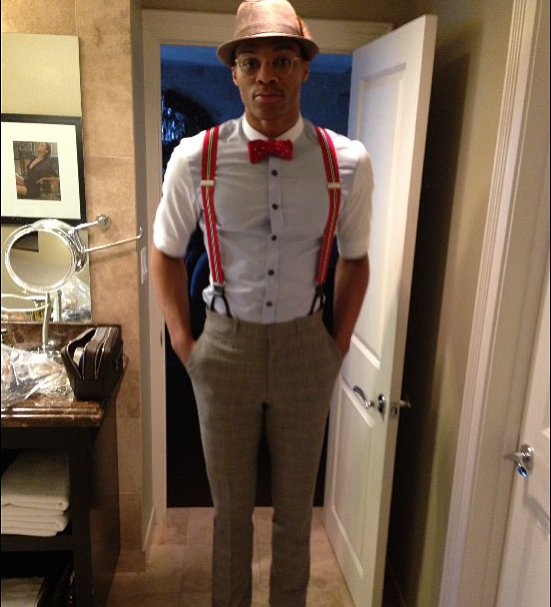 All Russell Westbrook(OKC Thunder) was missing was a accordion with this ensemble, I hope he has a good Yodel. 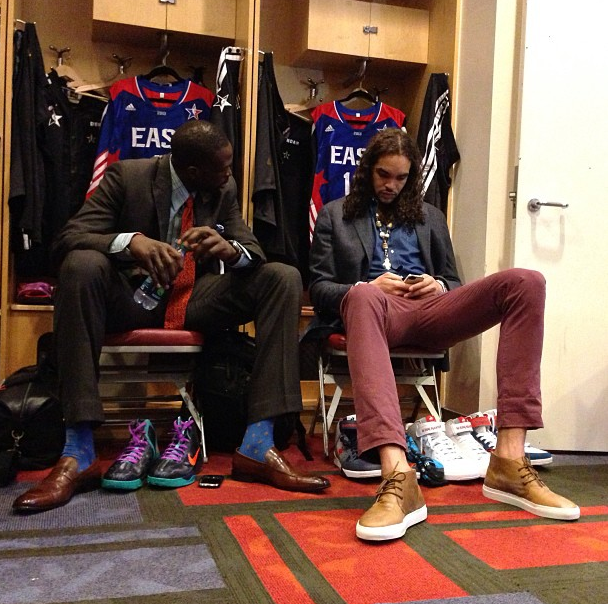 Chicago Bulls All Stars Luol Deng kept it formal in classic threads, as Joakim Noah went with a causal approach in burgundy pants and brown chukkas. 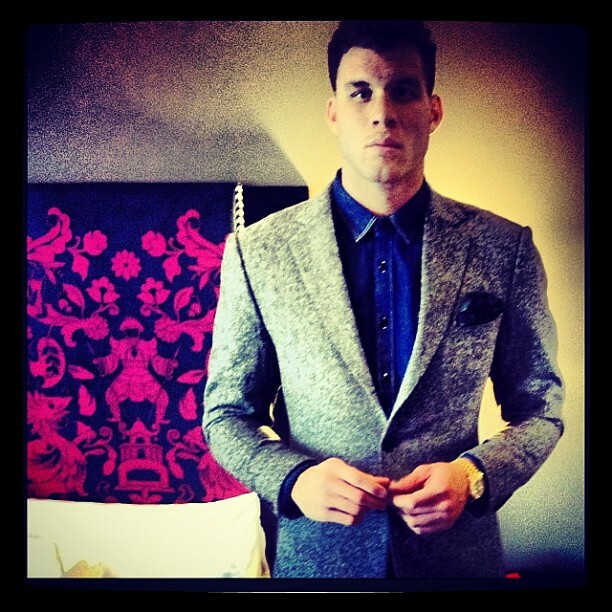 Blake Griffin(LAC) donned a elegant wool flint grey Waraire Boswell blazer jacket, he completed with a indigo denim shirt. Waraire Boswell in becoming the premier suiting for the gentlemen of the league. Your boys are Fresh! 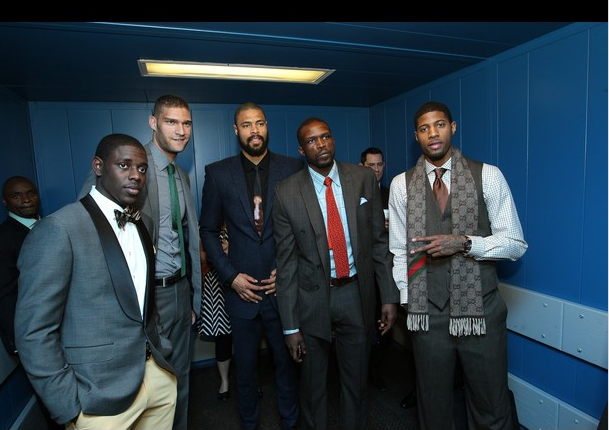 Jrue Holiday(76ers),Brook Lopez(Brooklyn Nets), Tyson Chandler(NY Knicks), Luol Deng(Chicago Bulls) , and Paul George. 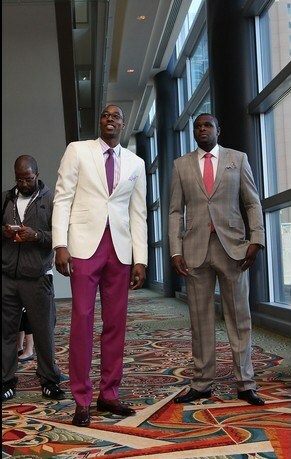 La Lakers Dwight Howard mad a bold fashion statement with his purple pants, and Zack Randolph(Memphis Grizzlies) looked suave in his grey glen plaid suit.